By Philip Taylor · Filed Under: Personal Taxes · February 21, 2019 · · Part-Time Money is supported by you. When you sign-up for services or buy something through links below, we may earn an affiliate commission. Learn more about how we make money. The April tax deadline will be here before you know it. Since you aren’t living on this money on a day to day basis, this windfall can be used to better your situation. Overall, I like to see people use their tax return to get ahead. This is a great time to build up your emergency fund, get out of debt, or put towards long term savings. You see (above) what I’m doing with my tax refund, along with my standard recommendation. But let’s look at some other things you can do with your tax refund. Here are nine smart ideas. Everyone needs an emergency fund to help them through a tough financial situation, like a job loss, car accident, or medical emergency. You need an emergency fund to create that cash cushion between you and your need for credit to solve the problem. The standard advice is to shoot for about six months of living expenses. I think that’s fair, especially if you have two incomes in the home and your jobs are fairly stable. Know your risk though and make sure your emergency fund is big enough based on you. If you’re looking for a place to open up an emergency fund, look no further than an online savings account. Debt stinks. It causes stress and wastes money due to the high-interest payments. Get rid of it. Make a solid plan to get out of debt (i.e. debt snowball) and get it paid off as quick as possible. A big tax refund could really wipe out a bunch of debt. If you’ve just got mortgage debt, consider making a principal-only payment. Don’t go into debt to afford life’s upcoming necessities and pleasures. Use your tax refund. My favorite (best) thing to do with your tax refund is to do what I did, use it towards retirement savings. If you have a 401K through your employer, you could stash the funds there. Many people use their tax refund to open an IRA. You guys know I love these. You can open them on your own with an online stock broker and you can control just about everything that happens with the money there, unlike your 401K. Of course, there are the tax benefits that come along with saving for retirement with your tax refund. You could actually increase your return if you contribute to a traditional IRA, or SEP IRA (or even a Solo 401K) if you’re self-employed. Some people choose to use their tax refund to open up a 529 college savings plan for their child(ren). Money that goes into your 529 plan can grow tax-free as long as it’s used for qualifying expenses. As long as you choose a “savings” plan vs a “prepaid” plan, your child(ren) can use the funds at any college or university that they want. Use your tax refund to go back to finish or start a degree. I love seeing people invest in themselves. Do it for fun, or see it as a way to increase your earning potential at your current (or future) employer. If you own a business or have income where the tax isn’t withheld, it’s likely a smart idea to take some of your refund and use it to make estimated tax payments or at least save it for future tax payments. Getting a tax return this year? Be smart about it. 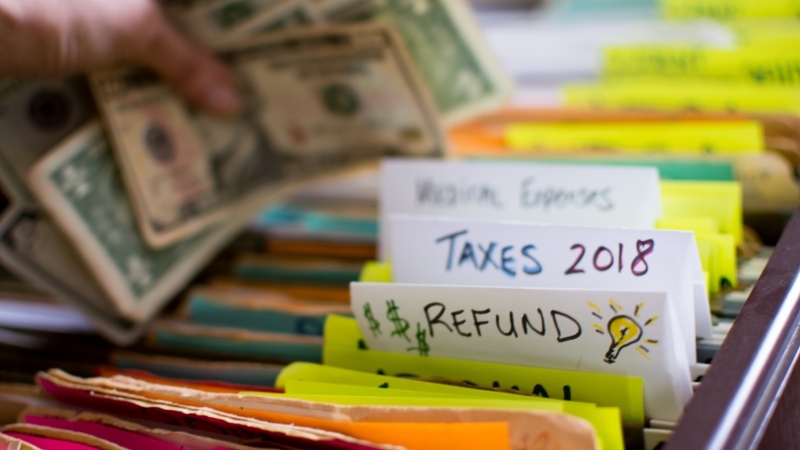 Here are 9 smart ways to spend your tax refund. Now you have the cash to start that business you’ve always wanted. You can tell someone is really passionate about their business idea when they self-fund the thing like this. Using your own money to start a business is definitely a better idea that taking out some business loan or borrowing from your relatives. Related: Start a Business with No Money: Do You Want it Bad Enough? If the tax refund is a surprise to you, then why not use it to help a worthy cause. There’s definitely some organization that could use the funds more than you. If you do decide to give, use a qualifying charitable organization and get a deduction next year on your taxes. TaxAct If you click this link and make a purchase, we earn a commission at no additional cost to you. There are lots of things you could do with you refund: save, spend, give. What do you plan to do with your refund? If you already spent the money, what did you spend it on? I had the IRS direct deposit my tax refund directly into my “House Fund” savings account. Out of sight, out of mind. Plus I’m now so much more closer to my house down payment goal! No refund for me this year. 🙁 underestimated income, thus I’m cutting a big fat check. For me I will be taking a holiday and saving the rest for a rainy day as my savings are too low at present! No tax refund here. We pay out our noses at tax time. If we did get a refund I’d be sticking it straight into retirement savings. Quick and painless… it’ll feel like you never had it. What’s a tax refund? Lol. I rarely see a tax refund but this year I should be getting one. Mostly because I had extra withheld from my paychecks to compensate. I’m thinking about putting 50% of the refund into my Roth IRA and 50% towards my car loan. Saving for the future and paying off debt! It’s a win-win. Hoping to invest in some nice powder skis! I’m using 1/3 for vacation, 1/3 for savings, and 1/3 for some things we’ve been saving up for. I like getting a refund so i plan on it in advance. Well, I have overpaid Quarterlies and UI and I roll them over to the next period. Good news, I haven’t had to pay quarterlies this year yet. Bad news, I still have to pay personal taxes. We’re getting around 2K back, 1K is going right into savings, I’m making an extra payment on my snowball cc, about $300 is going into a fund for kids summer camp, and my wife is going to get new glasses. Anything left over is going toward an overdue car repair. I try to keep my refund really low. We didn’t get a refund this year. Because my blog income was higher than I expected I ended up having to pay about 4000 dollars in taxes at the end of the year, and then another 2100 or so in estimated taxes for 1st quarter 2010. It’s nice that i’m making extra income, but not so fun cutting those big checks! We’re using 1/3 of it to replace the money we paid our accountant to do our taxes, 1/3 straight into savings, and the other 1/3 to get a few things for around the house.